VEHICLE ACCESS TO ST JOHN'S E15. Whatever direction you are coming from PLEASE DRIVE CAREFULLY - there are a lot of confused people out there! In general, the permanent vehicle entrance to St John's Car Park is from The Grove. (See picture. At the moment, this entrance looks narrow but it is used by cars, delivery vehicles and the Road Builders' 30 ton trucks, so it does work). This entrance will change, temporarily, for road works at some stage. Check the Twitter feed on our website Newsletter page for changes. IF YOU ARE APPROACHING FROM MARYLAND - easy! Turn right from The Grove at the top of the Church railings, into the access road, then follow this road round to the Church gates. It's 2-way, but access only, so there should not be too much traffic, but watch out for cyclists & pedestrians. If you go whizzing past with the Church on your left, you have to go along Romford Road - no other option. Turn round, when safe, and follow directions FROM ROMFORD ROAD, as above. 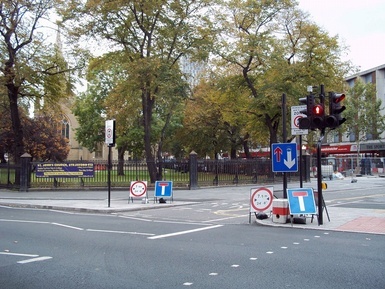 A Map of the new road layout is available from the Newham Council website. During the week there is a chain across the church gate. Park with the bonnet of the car towards the chain, lock the car and come into the church reception to get the key. If you need the chain opened in advance, please call the Church Office on 020 8503 1913 to arrange this.